The clock read 2 a.m. as I began this writing session. Why on earth would anyone stay up this late to write about a physics building? Even if the building is spectacular (as is the Mitchell Physics Institute), this is a ridiculous time to write about it. Yet I’m doing so, because I am terrified that if I go an entire day without writing for 30 minutes, all my motivation will shrivel up, along with my graduation hopes. Fortunately, this building-writing project gives me something to write when my brain is too tired to write anything useful. Since my buildings are all on the Texas A&M campus, writing about them serves a critical purpose: it reminds me I’m a graduate student with a dissertation to finish. Surprisingly, writing about the Physics Institute fit perfectly into a night spent contemplating the gift of friendship. 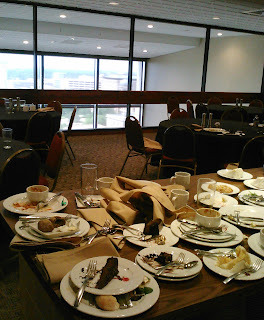 Just before my Physics Institute writing session (which, I’m glad to say, I spent on useful dissertation-related writing), I shared lunch with a graduate school friend. We are both so grateful to have found a kindred spirit to share our journey—commiserating through disquiet and difficulty, consulting over practical problems, and celebrating tiny triumphs. Though we’ve known each other only a few short months, we already know with absolute certainty that we will cheer each other on until graduation and beyond. Sadly, though I’ve been a doctoral student for nearly eight years, this is the first year I can honestly say I have grad school friends. I have had many grad school acquaintances. Some might qualify as friends…if we had reason to mention each other, we would say “my friend so-and-so.” But we don’t keep in touch, and we never shared our joys or tears. Why, for so many years, did I only make acquaintances and superficial friendships? Because I was drifting along, unwilling to expose my struggles to others, or expend effort creating ties that might make me accountable. Lately, I have changed my approach. I have made deliberate attempts to connect with other graduate students, both on my campus and elsewhere. As I’ve done so, my progress has improved. I don’t think it’s a coincidence. True friends are rare treasures, in grad school as everywhere else. Like nearly everything of great value, they cannot be obtained or kept without risk. I encourage you to take a chance and reach out a hand, either to a fellow traveler who’s drowning, to a willing rescuer, or to someone who just wants some company. You won’t regret it. Wow, what a cool building! By luck, I chose the entrance by the spectacular Foucalt Pendulum. It was tempting to break my one-photo rule, because the five-story cylindrical rotunda from which the pendulum hangs is almost as stunning as the pendulum itself. It proved impossible to take an upward-looking photo that captured both the pendulum and the concentric circles formed by five stories of balconies. 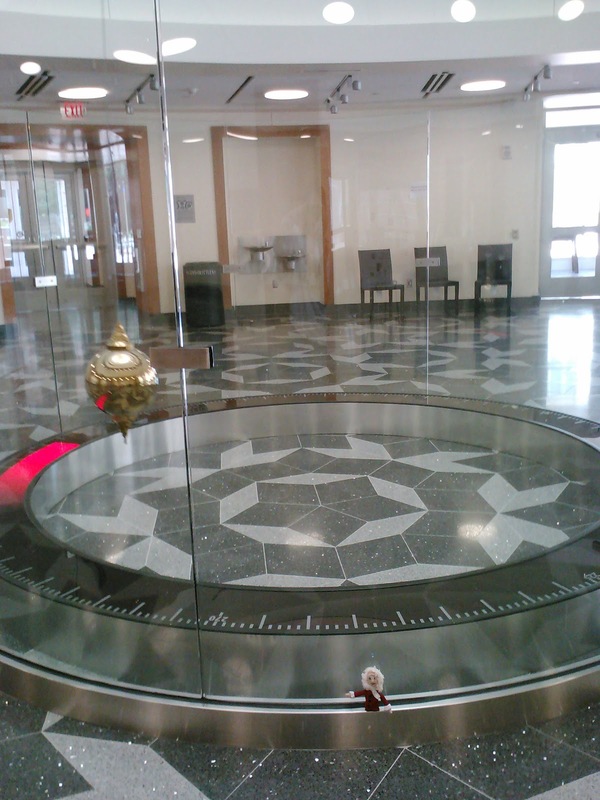 Forced to choose, I had to opt for the pendulum. 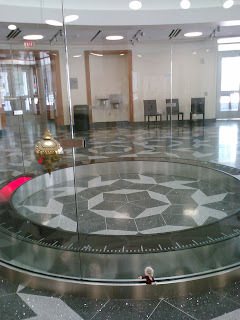 Reflected in the pendulum is the Penrose floor tiling. Every tile is a parallelogram, flecked with shiny bits. I would love to see this room at night—I’ll bet the floor looks like a dark sky full of twinkling stars, with occasional flashing red comets, as the lights on the rim catch the swinging pendulum. This beautiful building has two wings that meet at a right angle. One wing is access-restricted, presumably filled with labs. On the classroom wing, all three floors open to a light-filled atrium running the entire length of the building. Tall glass windows let sunshine stream in and allow a view of a desert-style patio featuring Texas vegetation. 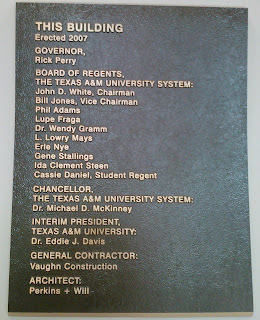 This is one of several new buildings A&M has constructed during the many years I have been a doctoral student. The piece of ground on which this building sits was once part of Lot 50, my designated parking location. (Each year, I pay $275 for the privilege of parking. I justify the expense by reasoning that if I had to pay cash for the parking garage every time I drove in from Houston, I wouldn’t come very often.) It’s entirely possible that I once parked my car in the exact place of today’s writing session. What struck me most about this building is that I had no idea of its name, even though I’d walked through it several times and once did a long writing session here. Most buildings do not hide their identity. They display it proudly, using large letters on their inside and outside walls, especially if they were named after an important (or wealthy and generous) person. This one doesn’t—I’ve walked its entire perimeter looking for a name. I thought of looking it up on the university website’s interactive map, but somehow that seemed like cheating. No, I would either find the name by wandering through the building, or it would remain nameless. So when I entered, I was actively looking for a name. Hooray, I see a bronze nameplate on the wall! Perfect! Unfortunately, the nameplate was not much help. Walking further, I found a clue. A banner on the patio outside read, “Visit the Sidewalk Café in the Emerging Technology Building”. Hmmm….could this be the Emerging Technology Building? Or is this simply an advertisement for a café on the other side of campus? To reach any other building, you must cross at least one 4-lane street, so perhaps the café is indeed here. Sure enough, as I scanned This Building’s atrium, I spotted a wheeled kiosk, shaped like a giant lunch pail with a closed lid. Lettered on its side were the words “Sidewalk Café”. This seems promising. But surely there are maroon Sidewalk Cafés scattered all over Texas A&M University—this particular Café may not be the Emerging Technology one. If I’ve learned anything in my research methods classes, it is that researchers must be careful claiming certainty. If I am going to present a conclusion as fact, it must be indisputable. I cannot yet say this is the Emerging Technology Building. All I can say is that the patio banner suggests this may be the Emerging Technology Building. I need more evidence. There are many comfortable writing nooks in This Building. I settled myself into a circular chair at a circular table, right in front of the This Building nameplate. As I wrote, I noticed a flat-screen monitor with rotating announcements, next to a scale model of the building (nope, no building names on the scale model either). One advertised the availability of naming rights for Emerging Technology Building classrooms, and another highlighted accomplishments of faculty members within two engineering departments. Though I still have no definitive proof, the data seem to support my hypothesis that This Building is indeed the Emerging Technology Building, home to the Biomedical Engineering and Industrial and Systems Engineering programs. Because of it, my walk from Lot 50 is a bit longer than it used to be. That’s okay—This Building is worth walking through. Well, my ground rule for the one and only one photo I am allowed to take is this: the photo must be of something interesting, visible from my writing location. Today was the first time I walked an entire building in search of something interesting to write about or photograph. I briefly considered the model helicopters in the Helicopter and Unmanned Systems lab on the main floor. The Analog and Mixed Signals Lab might have been a candidate, had it omitted the analog signals. An ice machine photo would now be redundant. Instead, I’ve simply photographed my second-floor writing location. 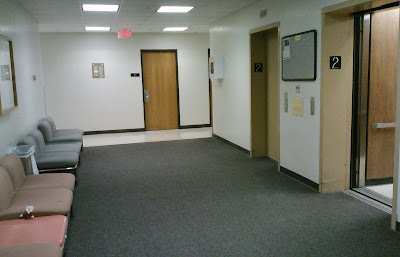 (The ice machine is just around the corner to the right, behind the far elevator). The photo accurately captures the personality of the Wisenbaker building: old, solid, plain, and very functional. The solid wood doors are in perfect condition, except for the scuff marks near the bottom—probably from years of graduate students pushing them open with their shoes, while transporting rice and ramen noodles from a distant microwave. A few suites have new doors with molding and etched glass panels—these look out of place, like a business suit in an engineering lab. Taking the photograph made me feel as if I were sneaking around spying on someone. This is not the sort of building people take pictures of. It’s also not the sort of building people write or study in. Students study in buildings they have class in—perhaps squeezing some homework into those precious hours between classes, or staying after class to study with friends. As far as I can tell, Wisenbaker has no classrooms, and certainly no cozy study nooks. Writing and studying happens behind closed doors, by graduate students sitting on duct-taped chairs at metal desks, in offices bare except for metal bookshelves full of old books and stacks of papers. I’m sure it’s been months since anyone wrote or studied in these chairs by the elevators. For some, Wisenbaker Engineering Research Center is home. For me, at least until today, it was a convenient pit stop—the closest building to the parking lot after a long drive from Houston. Thanks to my little writing tour, I have finally put a personality with the name. 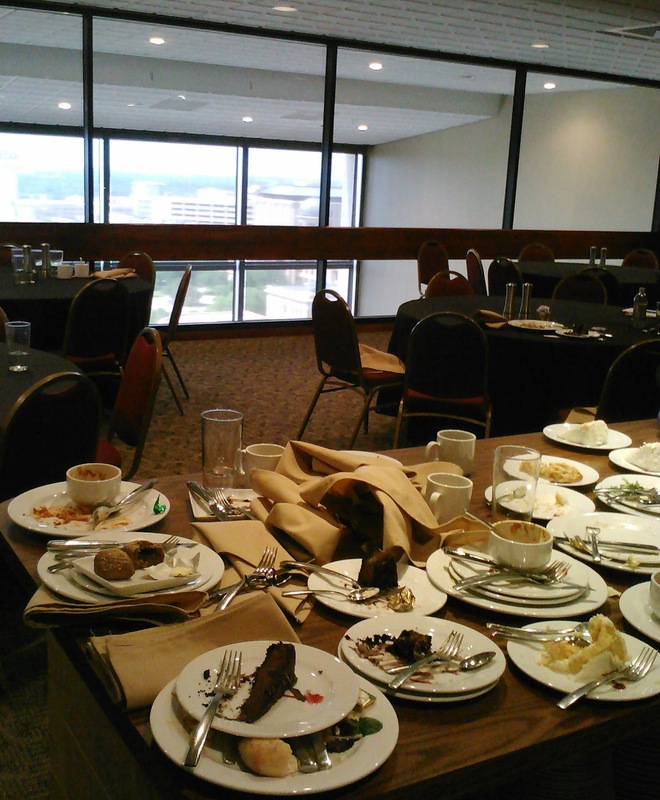 We’re on the 11th floor of Rudder Tower, in the University Club, and the view is beautiful. Yet to me, the dirty dishes are more special than the panorama I see through the window. They symbolize the friendship and support of other writers. Though I felt like an imposter attending today’s retreat for POWER writing consultants, everyone treated me as if I belonged. Two fantastic leaders talked us through how to improve our project planning and overcome writer’s block. I once tried to answer the question, “Are you a writer?” and got stuck, because I had no definition for what it meant to be a writer, or in fact any sort of ____-er. Are you a ______-er if you _____ regularly? If _______-ing makes you money? Or what? After today, I think you know you are a ____-er if you can relate to common struggles faced by all ______-ers. You’re a _________-er if, when you unexpectedly run across another _________-er, a spark leaps up between you, an instant connection and kinship you both recognize. A few weeks back, I noticed a timing tag on a fellow writer’s shoe and immediately exclaimed, “Oh, wow, you’re a runner too!” Even if I hadn’t been running much lately, I knew I was still a runner and she was too. We both know what it’s like to drag ourselves out to run when we’d rather be doing just about anything else. We know the misery of pushing our muscles to their limits. We know the feeling of telling ourselves over and over, “don’t you dare walk now”; we know the eventual exhilaration when we obey that mantra, and the regret when we don’t. We’ve both said “liar!” under our breath, when a well-meaning spectator shouts that the finish line is right around the next corner. I still have difficulty thinking of myself as a writer—to me, a writer is someone with a much greater mastery of the writing craft than I possess. Yet the more time I spend around expert writers, the more I realize they experience the same difficulties I do, perhaps even to a greater degree. Higher stakes and higher standards actually magnify the troubles. Next time you watch a running race, compare the face of the race winner with that of a typical midpacker like me—I think it will be obvious who is in the most pain. So, I need to remember that I and the master writers are all walking the same road—they are just a bit further along. Their feet once trod where mine are now—this gives me hope. My first stop (not counting buildings I’ve written in before this tour officially began) is the Evans Library Annex. Like most buildings on campus, I had never set foot in it before. 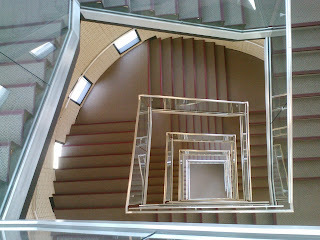 I entered in the most spectacular way possible, by the fourth floor skyway from Evans Library. The glassed-in tunnel provided an unobstructed view, and I couldn’t help stopping to gaze out over the campus. For those of us who work on the first floor, teach on the first floor, and live in a one-story house, looking down on treetops from above is a special treat. Trees are fascinating creations—if I were unfamiliar with trees, and someone presented me with top and side views, I wouldn’t even know they were of the same thing. I reluctantly turned my eyes from the campus beneath me to the annex entrance before me. Its most noticeable feature was the gold-colored wall around the entrance doors. Closer inspection showed the gilt walls were not metal, but laminate with a fake wood grain. The door frames appeared to be of the same laminate, but a warmer yellow gold—the walls seemed a sick greenish gold by comparison. Why didn’t they match? Did a contractor order the wrong color? Did the materials company discontinue a product in the middle of a job? Did someone get fired or reprimanded over it? Surely there is an interesting story behind the mismatch, one only a few people will ever know. Perhaps the door story is similar to whatever story lies behind the one-fourth of a modular house that sat near our subdivision for years. It used to be a whole model house, and three-fourths of it got hauled away. Fortunately, nothing so dire happened to the Library Annex, and I went inside. Since I enjoyed looking down at the trees so much, I climbed as high as I could, using the object of today’s tour stop photo: the coolest spiral staircase ever. As I climbed, my footfalls echoed with a hollow tinny sound, and the stairway vibrated beneath my feet. 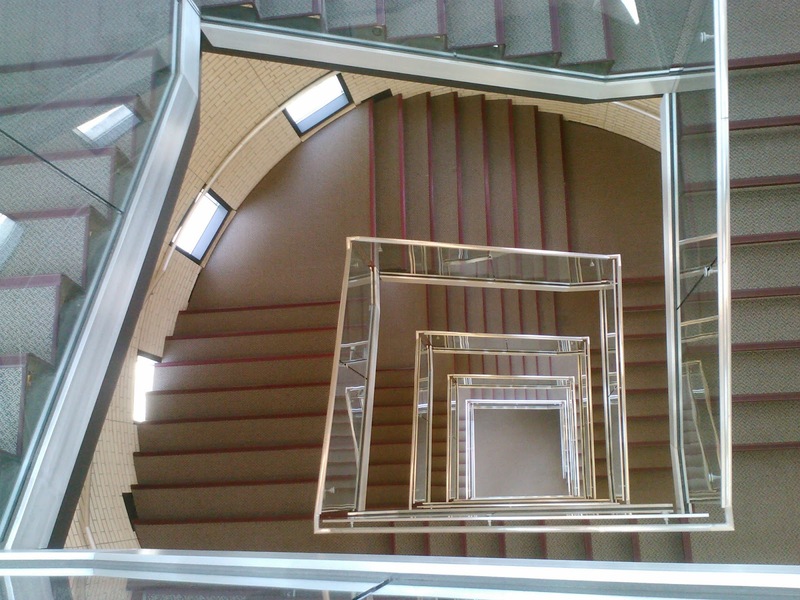 The walls keeping me safe were all of glass, so I could easily see the staircase’s marvelous geometry. I was a little nervous leaning over the rail to snap a picture, afraid my new smartphone would tumble to its death, taking my staircase photo with it. Phone safely stored away, I entered the Quiet Study Area. Some quiet study areas are full of ambient noise—not this one. Even though students filled the room, I could hear every page flip. As quietly as possible, I unzipped my backpack and took out my laptop. My keystrokes disrupted the silence and I felt rather guilty—perhaps I should have used a notebook, instead of a notebook computer, for this building-writing session. This seems to indeed be an area for Studying, not Writing. As far as I can tell, my low-to-the ground seat, of brown-striped upholstery, was designed for a very short person with the thighs of an NBA basketball player. I can’t imagine anyone of normal proportions being comfortable in it for long. Perhaps that’s why all the other students are at tables, and I am alone on the bench seats. To my right, I can see the brick turret containing the spiral staircase. To my left is a beautiful oak cabinet, probably intended to hold large maps. All the drawers were unlabeled, and the two I opened were empty. Presumably the other drawers are empty too. The cabinet is gorgeous, but why is it here? Another story. First tour stop over. It’s nearly finals week, and I plan to fill my summer break with serious writing. So I’ve let myself indulge a little, writing about the Library Annex while in it, instead of writing on my dissertation. I’m glad I did. Goodbye, Library Annex—I liked you. I’ll be back. 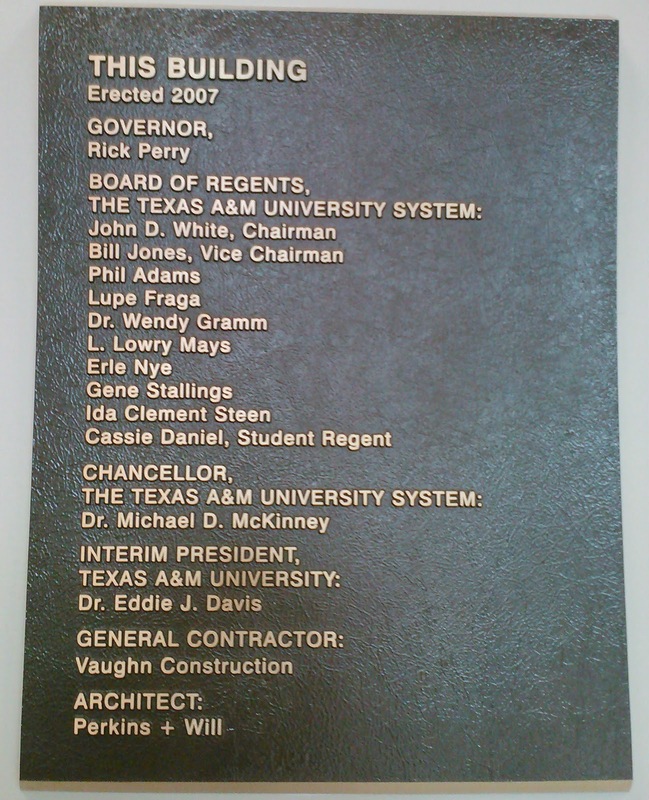 Welcome to the Texas A&M Building Writing Tour! While contemplating my new goal of writing in every campus building, it occurred to me it would be fun to chronicle the buildings as I go along, so I don’t forget the flavor of all the new places I’m seeing. Of course, this is a a bit of a gamble…I am essentially betting that writing in buildings will motivate enough extra dissertation-writing hours to more than make up for the hours lost to writing about buildings. If I’m wrong, my collection of detailed building descriptions will be my only consolation prize for never graduating. A friend suggested I photograph the buildings as I write in them. I like this idea, but am a little nervous about it—after all, I am trying to be a writer, not a photographer, so writing is the craft I should be practicing. I also recollect a wise observation by my brother Dave, after he read my summary of a 10-mile running race: “These days, so many epic, story-filled adventures, so many journeys of self-discovery, get reduced to thirty photos on Facebook. I fear the art of the narrative trip report is slipping away.” So this will be primarily a writing tour of Texas A&M, not a photo tour. Nonetheless, even Dave concedes there are times a photo can add to a story, instead of taking away from it. So, I will allow myself to indulge in an occasional photo, as long as it adds something unique, that can’t be added any other way. One photo per building—no more. The photo must be of something interesting that can be seen from my writing location. So, dear reader, thank you for joining my odd little tour of a unique university. Sit back, relax, and don’t forget to look around.